Chuck Schumer near the Livingston Ave Bridge today. 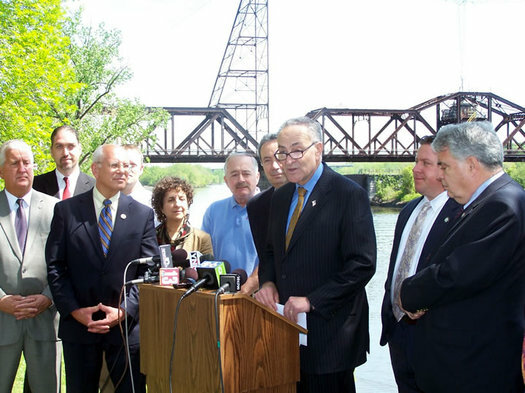 Chuck Schumer was in town today to push for the inclusion of a pedestrian walkway on the Livingston Ave Bridge -- regardless of what direction the project takes (rehab or total replacement). "For decades, people could easily walk over the Livingston Avenue Bridge and its sister, the old Maiden Lane Bridge, providing an important link between downtown Albany and the Rensselaer waterfront. ... Then all of that stopped, and the gates went up, shutting down the pedestrian link between these great cities. When the new bridge is built, we have a fresh chance to reconnect these two downtowns [Editors: Albany and Rensselaer] and funnel more visitors to key areas on both sides of the river. Failing to include a pedestrian component in this bridge would be shortsighted, and we can't make that mistake. That's why I'm urging everyone from CSX to Amtrak to NYSDOT to climb aboard with this plan, so that every design going forward will link up the biking and walking paths on both sides of the scenic Hudson." ... We will very likely have one shot to make sure that the walkway is installed while the funding, political will, and public sentiment are aligned. If the walkway is not replaced, Albany and Rensselaer will have world-class trail networks and beautiful, vibrant waterfronts that beckon visitors and residents alike: yet, people won't easily and safely cross the river from here. The Livingston Avenue Bridge is at least 110 years old -- and maybe 145 years old -- as Carl detailed last year. The rail crossing over the Hudson at that spot is key not just for current rail traffic, but also for the future development of high speed rail in the state. Federal funding for an upgrade at the crossing became available after Florida turned down its high speed rail funding last year. Another part of the picture: de Laet's Landing, the large mixed-use development proposed for Rensselaer's waterfront. It would sit just to the south of the Rensselaer side of the bridge. Wonderful to have Sen. Schumer on board as an advocate. This opportunity just can't be missed. I don't know. Building stuff is good and all, but NYS Bike Route 9 crosses the Hudson adjacent to the Dunn Memorial Bridge and also connects to the Corning Preserve multiuse paths. So . . . it's not the tools you have, it's how you use them. More tools, better tools, pricier tools won't make you do more with them. Yes, you can cross the Dunn by bike. I do it most days. But the climb is daunting and the descent is scary for novice or less able riders, getting to the ramp is an urban nightmare with dangerous street crossings (no driver on Quay Street in the history of ever has respected the walk light), and it's a long way to go a short distance. A river level crossing would be vastly preferable and a very pleasant addition. Why can't we have more bike infrastructure? It's a few planks and a fence when they rebuild the bridge, which they're going to do anyway. The challenging part is on the Rensselaer side, where there need to be some plans to get pedestrians around the train yard. Fair points, Carl. I probably shouldn't have had that extra helping of Curmudgeon last night. Well until they get that bridge they should be running a ferry if its so important. @Devon, I slightly agree with you, just because you build it, doesn't mean they will come, but feel the modest costs are worth it. The bridge has to be replaced anyway for Amtrak/CSX, so incorporating a pedestrian element is a miniscule investment considering all else that will be need to improve this infrastructure. Furthermore, more pedestrian friendly options for crossing the river the better. While there is the Dunn Memorial, that can be a haul for those in North Albany/Menands, plus, you have to choke on car fumes going that way. A relax ride over the Livingston Bridge would probably be more enjoyable for most folks. The very last sentence of the article in the TU today about this mentioned that the project in theory probably could start until 2017. That's horrible. I don't know if high-speed rail is really the way to go, at least as the first major foray into reviving rail transit in NY. Light Rail should really be focused on first. For one, it's probably more doable if it can be taken on in small segments rather than one collossal corridor route. Two, it's inevitalbe that this will be needed anyway. If you really believe High Speed Rail is the way to connect Buffalo, Albany, and NYC, think about this; how are you supposed to get to the rail hubs if you don't live in one of these urban cores...you either drive or you take...that's right, a light rail train. I don't see how a HSR system can work without a sophisticated system of feeder trains to support the communities neighboring the larger urban hubs. I'd hate to think that Chuck's just rushing into this because the federal $ that Florida turned down was already earmarked for expensive HSR.